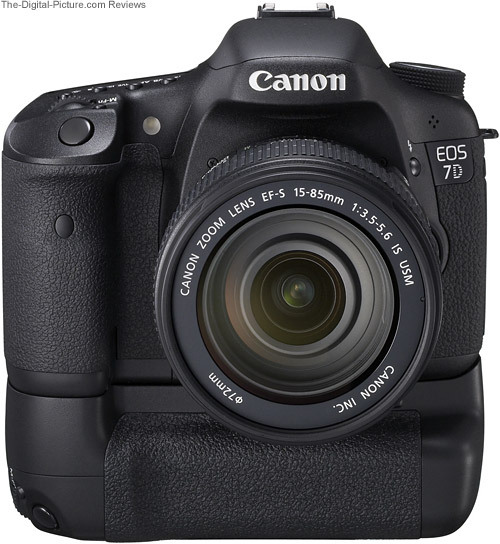 The Canon BG-E7 Battery Grip is the proper battery grip for the Canon EOS 7D. The BG-E7 review will sound very similar to the Canon BG-E6 Battery Grip Review as these two battery grips are very similar - nearly identically shaped and purposed - with one exception. The nice thing about Canon DSLRs without a built-in portrait/vertical grip (all non-1-Series bodies at this time) is that they are small and light. The big downside is that it is not comfortable to shoot in portrait/vertical orientation - especially for long periods of time. Thus, Canon makes Battery Grips for all of their non-1-Series bodies. 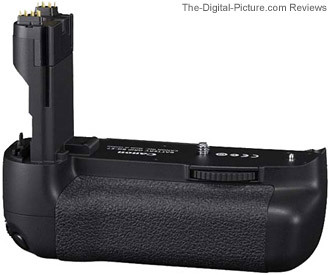 To install the Canon BG-E7 Battery Grip, the LP-E6 Battery is removed from the DSLR and the battery door detaches. The BG-E7 slides up into the battery compartment and locks into place via the tripod socket screw on the BG-E7. The BG-E7 provides its own tripod adapter threads - this functionality is not lost. The BG-E7 holds two Canon LP-E6 Batteries that deliver double the number of shots or video time from the 7D. Alternatively, use 6 AA batteries in the included Canon BGM-E7 Battery Magazine. Six Alkaline AA batteries are rated for 400 shots (a single LP-E6 is rated for 1,000 shots). Since the AA batteries are not chipped, the 7D is not going to show you detailed battery information when using the BGM-E7. Though the BGM-E7 is a nice feature, I don't personally use it. Even if you only have one LP-E6 battery, the BG-E7 still functions fine. The AA option is nice for emergency purposes. Back to the grip. The Canon BG-E7 Battery Grip is very solidly built - it matches the 7D design well. They share a magnesium alloy frame and the BG-E7 retains the sealed battery compartment. Most of the controls present on the built-in 7D grip are also found on the BG-E7 including Shutter-Release, Main Dial, AF Point Selection, AF/FE Lock and AF-ON. And, don't forget the power on/off button I usually forget to turn on after installing a grip. The power button is always shipped in the off position. With the BG-E7 installed, the 7D becomes similar in size to Canon's 1-Series bodies. In use, the BG-E7 makes portrait/vertical shooting much easier and more comfortable. I can feel the difference in my arms and shoulder after even a moderately long shoot. And I can hold the camera in vertical orientation a little steadier in this position. I find the BG-E7 a little bulky and there is a slight amount of flex where the grip matches to the 7D at the battery compartment. The one BG-E7 difference from the BG-E6 is that the vertical grip shutter release is slightly more sensitive than the 7D's shutter release. This is a flaw in my opinion, but it does not significantly adversely affect the use of the BG-E7. Overall, I think the Canon BG-E7 Battery Grip is very useful.